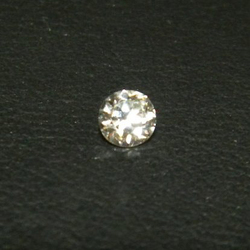 This single diamond was the client's first diamond from her engagement ring. It is now set in the pinkie ring. 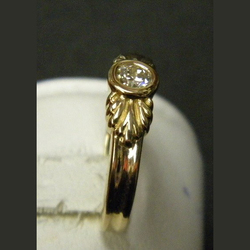 The single loose diamond was set into this yellow gold ring. 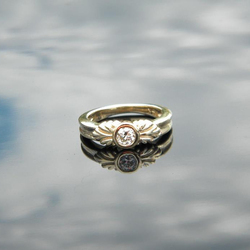 Set in a bezel this setting is perfect for a pinkie ring, providing protection to the diamond. 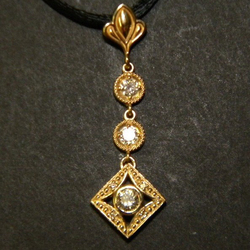 Side view shows the detail on each side of the center diamond. 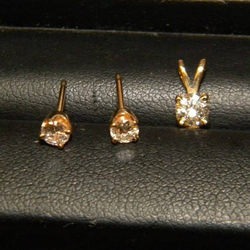 The original diamond from the pendant is set in the bottom piece and the two earrings in the top two sections. 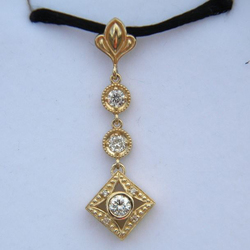 The bottom piece is designed as a single pendant but we decided to add the two pieces and bale to create a longer piece.